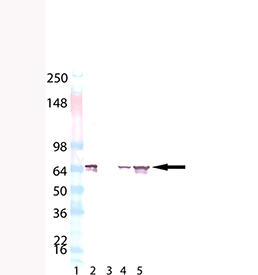 Western blot analysis of HSP70/HSP72, mAb (C92F3A-5) (AP conjugate) (Prod. No. ADI-SPA-810AP): Lane 1: MW marker, Lane 2: HSP70/HSP72 (human), (recombinant) (Prod. No. ADI-NSP-555), Lane 3: HSC70/HSP73 (bovine), (recombinant) (Prod. No. ADI-SPP-751) (Negative Control), Lane 4: HeLa (Prod. No. ADI-LYC-HL100), Lane 5: HeLa (heat shocked) (Prod. No. ADI-LYC-HL101).